CHARLES: Well, to begin with, I haven’t forgotten Elvira. I remember her very distinctly indeed. I remember how fascinating she was, and how maddening. I remember how badly she played all games and how cross she got when she didn’t win. I remember her gay charm when she had achieved her own way over something and her extreme acidity when she didn’t. I remember her physical attractiveness, which was tremendous, and her spiritual integrity, which was nil. Written in a mere five days in 1941, Blithe Spirit tells the story of Charles Condomine, a novelist working on a book about the occult. In order to research his novel, Charles invites eccentric local medium Madame Arcati to perform a séance at his house. Much to his surprise, the séance is a success, and Charles inadvertently summons the ghost of his late wife, Elvira. Needless to say, this creates a tremendous amount of tension between Charles and his current wife, Ruth, who suspects that her ghostly predecessor will do anything to be reunited with her former husband--even kill him! Poster designed by Okanagan College Writing and Publishing student Caitlin Voth. 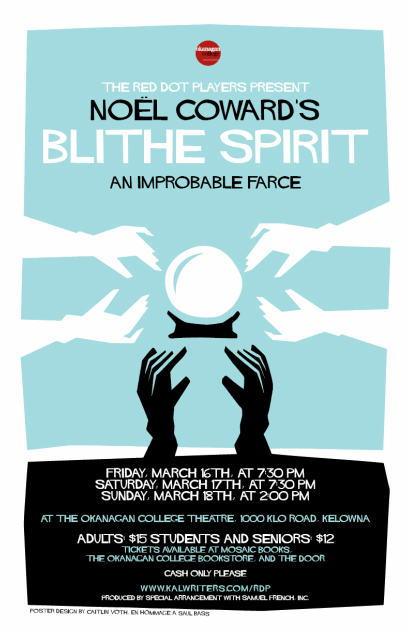 Playwright Noël Coward tackles marriage, mortality, and much more in Blithe Spirit, the hilarious supernatural comedy being presented by the Red Dot Players on March 16, 17, and 18 at Okanagan College. As the curtain rises on Blithe Spirit, Charles and Ruth Condomine are hosting a séance at their home. Charles, a novelist writing a book set in the world of the occult, has arranged for the eccentric Madame Arcati to perform a séance as part of his research. Much to his amazement, the séance is a success, and he inadvertently summons the spirit of his late first wife, Elvira. Things become even more alarming for Charles when he learns that his ghostly former spouse will do anything to be reunited with him—even kill him! Although he wrote it in a mere five days, Blithe Spirit was one of Noël Coward’s most successful plays, enjoying lengthy runs in London and New York. In 1945, David Lean directed a film adaptation of Blithe Spirit starring Rex Harrison and Margaret Rutherford. Since then, the play has been revived on Broadway several times, most recently in a 2009 production featuring Rupert Everett and Angela Lansbury. The Red Dot Players is a theatre troupe consisting of Okanagan College students and employees and community volunteers. The cast of their current production includes Chelsea Konechny, Jessie Greer, James Paley, Mike Boulter, Ann Marie Ruether, Dorothy Dalba, and Laura Savoie. Performances of Blithe Spirit will take place on March 16 and 17 at 7:30 and on March 18 at 2 p.m. in the Okanagan College Theatre, located at 1000 KLO Road in Kelowna. Tickets can be purchased at Mosaic Books, the Okanagan College Bookstore, and the door.